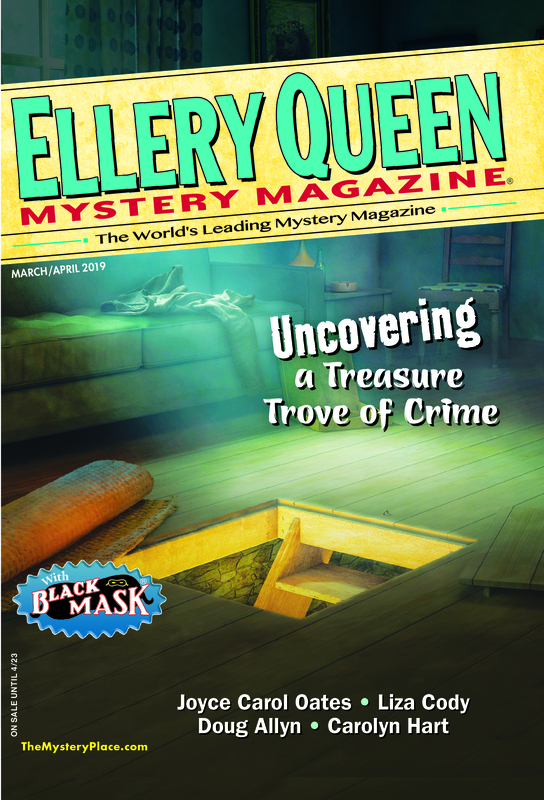 It was during the early 1970s that I first started reading Ellery Queen’s Mystery Magazine regularly. Copies were always for sale at grocery checkout counters for 75 cents—this was, after all, forty years ago. I would turn first to stories by Edward D. Hoch. They were always well told, they had interesting characters and settings, and they were usually fairplay detective stories with all the clues given to the reader. During 1971 the issues also contained stories written by the pseudonymous “Mr. X.” Under the series title “The Will-o’- the-Wisp-Mystery,” each of the six stories was complete in itself but each ended in a cliffhanger leading to the next story. This, I said to myself, was the way a mystery story should be told. It was only later that I learned the “Mr. X’ was actually Edward D. Hoch, and the idea behind the series was the brainchild of Ellery Queen himself. Later that year, I found on a newsstand a paperback book, in the same format as Ellery Queen’s Mystery Magazine, with the title The Spy and the Thief, and its author was (I was delighted to discover) Edward D. Hoch. The book featured two of Hoch’s series characters, Jeffrey Rand and Nick Velvet, and the introduction was by Ellery Queen. The introduction mentioned in passing that Hoch had written another short story collection—one that I had never heard of (The Judges of Hades) about a character about whom I was also unfamiliar (Simon Ark). I looked and looked but couldn’t find a copy anywhere—this was long before the Internet. With some trepidation, I decided to screw my courage to the sticking post (whatever Shakespeare might have meant by that phrase) and wrote to Hoch himself in care of the magazine. A short while later, a parcel arrived from the author enclosing not only a copy of the book (warmly inscribed) but also a second Simon Ark collection, City of Brass. All of which is a long way of saying that I discovered that Ed Hoch was not only a wonderful writer but a heck of a nice guy as well. Ed Hoch was a rare writer, probably a unique one, in that he made a living as the author of short stories. Decades ago, in the heyday of the pulp magazines (like Black Mask and Dime Detective) and the mass market “slicks” (like The Saturday Evening Post and Collier’s), a writer could be a short-story specialist, but today’s market doesn’t allow such specialization —unless you happen to be Ed Hoch. He eventually wrote about 950 short stories in various genres—science fiction, Westerns, historicals, young adult, and several very fine ghost stories, but he quickly emphasized mysteries and detective stories. He tried writing novels. One, The Shattered Raven, featured the Mystery Writers of America. He also wrote a series of three novels, beginning with The Transvection Machine, about the Computer Cops investigating future crimes. He even became a ghost writer for one of the paperback original novels that was credited to “Ellery Queen” —The Blue Movie Murders. But he said a week or two after he started on a novel, he wanted to work on other ideas that were always bubbling up inside his brain. And in many ways that was the key to Ed’s genius. An idea would come to him—a way of murdering someone in a locked room, a crime committed in a cabin surrounded by unmarked snow, a person who jumps from a window and vanishes—and it would percolate in his head; he would ponder it, manipulate it, come up with an original way of handling it, and a compact story would emerge. Ed loved a challenge. Friends would dare him to come up with a solution to an ingenious situation—and almost nothing would stump him for long, When he was challenged to devise a murder within the rotating door of a department store, he, of course, solved it. I was with him when he began to think about a plot device as he got on an escalator and would have it worked out by the time he got off. I suggested that he write a story based on a famous plot device, the “Paris Exposition” story, a late-19th, early 20th century legend of a mother and son who arrive at a hotel at the Paris Exposition in 1889. The lad leaves the hotel for an hour or two, but when he returns his mother has vanished and the hotel denies that she was ever there. In some versions, even the room in the hotel has vanished. Mystery writers from Anna Katharine Green to Cornell Woolrich to John Dickson Carr adapted various parts of this story, and such movies as Bunny Lake Is Missing and the television series Monk also used it. Ed, of course, had little trouble devising an original variant in “The Problem of the Leather Man,” and he slyly used my name in it for a character who, in fact, doesn’t actually appear. Ed’s first published story was “Village of the Dead” about Simon Ark; it was published in 1955 in Famous Detective, one of the last of the pulp magazines. Ark was Hoch’s tribute to the long tradition of detectives who investigate the occult. Ark spoke an ancient Coptic tongue and he implied that he had been alive for 2000 years. The cases he solved had to do with weird religious rituals and witchcraft and vampires. Soon Hoch was inventing series character after series character: Father David Noone, who combined Catholic theology with crime solving; Captain Jules Leopold of a city very much like Hoch’s hometown of Rochestesr, New York; Ben Snow, a cowboy detective in the old West who is often confused with Billy the Kid. In 1962, he broke into Ellery Queen’s Mystery Magazine and Alfred Hitchcock’s Mystery Magazine, then as now the two premier magazines in the field. By the time I was a regular reader of EQMM in 1971, he was in almost every issue, and beginning in May 1973 he began an unbroken record of being in every issue for the next thirty-five years. Eventually, he was pictured six times on the cover of EQMM, a record surpassed only by Sherlock Holmes. Annie Sears and department-store buyer Susan Holt, whose business life took her around the world. Hoch also created a youthful pair of crime-solving couriers, Juliet Ives and Walt Stanton. For many readers—myself included—Hoch’s finest creation was Dr. Sam Hawthorne, a New England country doctor from the first half of the last century who is faced with a series of impossible crimes—a wagon that enters a covered bridge and vanishes, a man murdered in a voting booth, a child who disappears from a swing, another child who vanishes from a bicycle, even one that seems to re-create Charlotte Perkins Gilman’s famous tale of the yellow wallpaper as an impossible crime. As wonderful as these stories are in their ingenuity and superb storytelling, I remember Ed Hoch mainly for himself. After he sent me those two books in 1971, Ed and I corresponded and spoke on the phone frequently until we met in person in 1986 at a Bouchercon in Baltimore. From then on, we saw each other at every Bouchercon and almost every Malice Domestic convention. Joined by our close friend Steve Steinbock—who now writes the book review column for EQMM—Ed and Ed’s wife Pat and I would have dinner together and debate whose turn it was to be the host. Ed would always order the same dinner—filet mignon cooked well-done (to the consistency of a hockey puck) and french fries, with vanilla ice cream for dessert—except at the Bouchercon in Denver in 2000 when we went to a Western restaurant which not only had a young woman in tights and a feather boa on a trapeze overhead but also Western meats on the menu. I can’t recall whether we persuaded him to have buffalo or elk, but it was one or the other. He survived. Ed had an encyclopedic knowledge of mystery and detective fiction, and he knew everyone worth knowing in the field. It is often said of people that he or she “never had a bad word to say about anyone,” and then someone will smirk knowingly and (wink, wink, nudge, nudge) recall when he or she did in fact have some bad words—but that was never true about Ed. I cannot recall when he ever said anything unkind or ungenerous. Like Anthony Boucher before him, Ed was a devout Roman Catholic with a strong concern for social justice. Often we would talk about religion. On one occasion at a Bouchercon, Steve Steinbock and I were at a bar (where else?) discussing some point or other about religious doctrine, he from a Jewish viewpoint, I from a Christian (Episcopalian) perspective, when we saw Ed coming down the stairs across the lobby. Steve and I remember differently which one of us yelled, “Ed! Come here; we need a Catholic!” Ed, of course, came over. I am sure we never resolved anything, but friends don’t need to. On January 18, 2008, Janet Hutchings called me to say that Ed had died suddenly that morning. I was in shock. The mystery community had lost a great writer; the world had lost a great and good human being; but personally—and this was uppermost in my mind, and still is—I had lost a close friend. A number of Edward D. Hoch short story collections are available through Crippen and Landru at http://www.crippenlandru.com. EQMM will also be reprinting a Hoch short story in this year’s December issue. This entry was posted in Guest, Memorial and tagged classic_mystery, doug greene, douggreene, ed hoch, Edgar Awards, edhoch, ed_hoch, ellery queen, elleryqueen, eqmm, friendship, literature, Malice Domestic, memoriam, MWA, mystery, noir, publishing, short story, suspense, writers. Bookmark the permalink. very nice piece. i met Ed twice, and was privileged to chair a panel he was on. An amazing writeer and a classy guy. Such a nice remembrance here — not only of the writer but also of the man behind the stories as well. A very touching tribute and well-deserved. I was only privleged to meet Ed once, but he was every bit as gracious as he was talented. Ed was a great guy. At the London Bouchercon, I pitched him an idea for a short story – he was kind enough to praise it and generous and tactful enough to tell me how to improve it! What a lovely tribute. I have been reading Ed’s stories for so many years that his passing was like losing a close friend, although we had never met. Wonderful tribute to a wonderful friend. Ed was a special man. Thanks for the article, Doug. A wonderful piece! Eloquent and informative. Doug, I’m late to the party, having just found out about this blog’s existence, but I wanted to add one more anecdote about that unique writer and wonderful man Ed Hoch. In my parody of the Sam Hawthorne stories, “The Problem of the Vanishing Town,” I made passing reference to some of the events of the fairly uneventful summer of 1928, including “the clown from the circus who was mauled by a lion on the fifth floor of the Northsouth Hotel when the lion was in his cage five blocks away.” The idea of course was to describe a situation so impossible (not to say ridiculous) that no one could possibly solve it rationally. But Ed took the challenge and did it in a story called “Circus in the Sky” (in the 2000 Crime Writers Association anthology SCENES OF CRIME, edited by Martin Edwards).